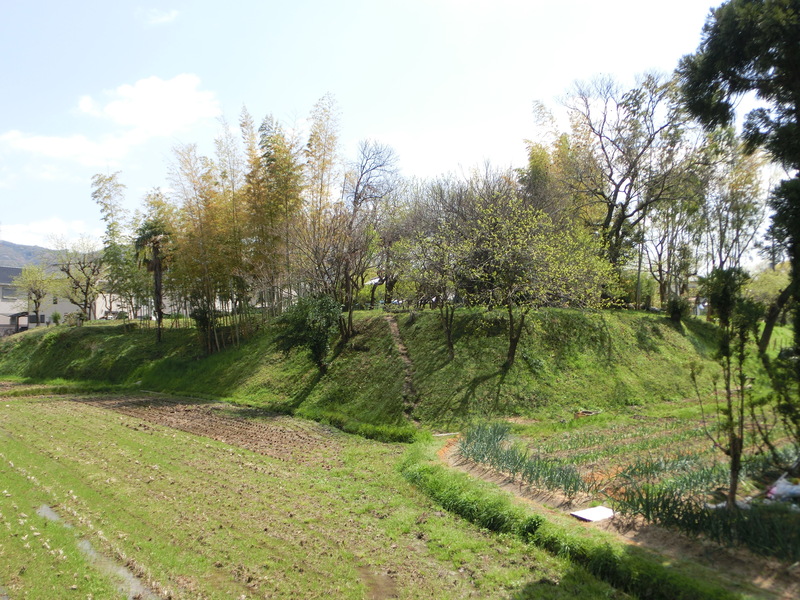 It is said that the Kisabe castle was built here (currently the Kisabe area). In the Sengoku period (from the middle of the 15th century to the beginning of the 16the century), the Kisabe Castle was built in the current Kisabe area. The Kisabe Castle was a rare castle on a plain, although many castles were built on craggy peaks due to defensive reasons. 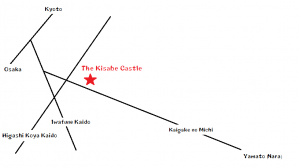 It is said that the Kisabe Castle was a wooden structure directly on ground unlike the Osaka Castle and the Himeji Castle, which were built on stone walls. The reason is that the Osaka Castle and the Himeji Castle are castle models early in the 16th century. The Kisabe Castle was allegedly a building in the middle of the 15th century and did not have a tower (Tenshukaku) and a small keep (Sho Tenshu) like castles in the beginning of the 16 century. Katano is located in the Kawachi area. In the Muromachi period, it used to be controlled by the Hatakeyama, who was designated as the Kawachi Shugo Daimyo. The ‘Shugo Daimyos’ system developed in the Muromachi period. They had not only military power to enforce Muromachi Shogunate’s orders and to reconcile conflicts between local land owners but also economic power to collect taxes. But, Shugo Daimyos‘ subordinates, in effect, did Daimyo’s duties in each province since Daimyos controlled some separated areas and resided in Kyoto for quickly responding to Muromachi Shogunate’s requests. Hence, the Kawachi Shugo Daimyo, the Hatakeyama, also bade his subordinates (the Yusa, the Kisawa, and the Yasumi) govern the Kawachi area. In three subordinates, the Yasumi was in charge of the Katano area. Kiyonori Yasumi allegedly ordered the construction of the Kisabe Castle in the Nanbokucho period. However, there are no concrete materials proving the allegation. 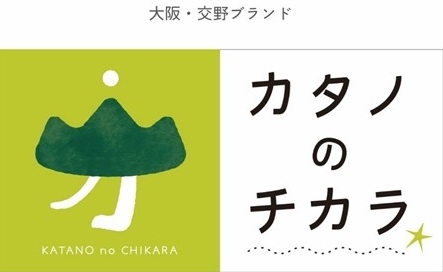 The chronicle of Nobunaga Oda, ‘Shinchokoki‘, refers to the Kisabe Castle. It is written about the period from 1568 to 1582 and is regarded as an important source to learn the Japanese medieval era, particularly the Sengoku period. 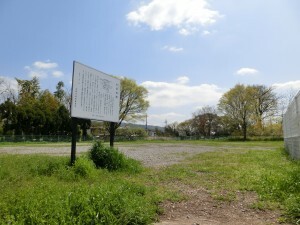 Hence, at least, the historical fact that the Kisabe castle already existed in the middle of 16th century can be confirmed, although it is unclear when it was built. Katano was on a significant rode to access from Kyoto and the central Osaka to Nara (see Image1). When Nobunaga Oda initially came to Kyoto, hostile forces such as Ishiyama Honganji in central Osaka, marchants in Sakai, and the Azai-Asakura coalition in Echizen remained. Particularly, in the Nara area, Hisahide Matsunaga, who was a superior strategist, attempted to occupy Katano for making a junction under his control. Image1. The Kisabe Castle laid on an important junction between Higashi Koya Kaido and Kaigake no Michi. *I owe many thanks to Mr. Hideji Takao, who gave me many useful materials about the Kisabe Castle.